This research explored how identity transitions are accomplished when individuals experience distress in relationship to the social systems in which they are embedded. Study participants grew up in cultic groups, where they were parented by committed members. Twenty-two people who chose to leave or were ejected from 12 cultic groups provided low point, high point, and turning point stories for an exploratory narrative analysis. Life story narratives revealed a jarring disconnect between what participants were expected to believe and become and how they experienced themselves. 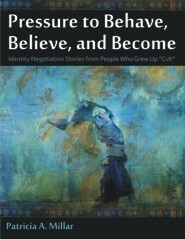 The research interviews provided richly textured data about the experience of growing up cult, the process of leaving, and what helped or hindered as participants navigated new social contexts. A categorical content analysis showed that participants experienced pressure and a sense of isolation. Adverse events such as neglect, abuse, and violence were reported. Many experienced the loss of family and friends as the exit cost for leaving. The research showed that a crystallization of discontent motivated participants to leave despite resource deficits and considerable uncertainty. During the process of constructing identities more congruent with an emerging sense of self, participants rejected worldviews inculcated during childhood. Results challenge theories that situate identity negotiation as a stage-specific dilemma that occurs during adolescence. The analysis indicates that exposure to diverse views and role models; exploration of personal truth and experimentation; and skill development in critical thinking and reality testing were important to successful adaptation. A key finding suggests that existing therapeutic approaches grounded in cult education and recovery from abuse would benefit from a complementary focus on identity development. Winner of 2013 "Dissertation Excellence Award"
Patricia Millar, Ph.D., works as a transition coach helping individuals to take up new phases of their lives with greater confidence. She is available to consult to families that have been affected by cultic systems and to individuals who need the support of a transition coach as they explore who they are and who they want to become. Patti’s passion is to better understand the trauma that occurs in contexts of coercion and violence and to investigate the core processes and enablers of post-traumatic growth. Prior to obtaining her doctorate, she held senior consultant and management roles in organization development and learning solutions.